In 2007 Dr. Nordgren began an adventure to spend 12 months traveling through 12 national parks. In each of those parks he spoke to park visitors and rangers about the world of astronomy on display every day and night in the national parks. By night park visitors have an unparalleled view of the stars beyond thanks to the efforts of park rangers to preserve and protect the natural landscape. But by day, that same landscape is often an excellent example of geological formations and processes at work on other worlds. Ever dream of walking on Mars? Then take a walk through the red-rock country of Arches National Park. Starting in 2008 Dr. Nordgren began working with the National Park Service to help train park rangers to share the latest astronomy and planetary science results with the general public. Through this scientific outreach, millions of park visitors every year are informed about the latest NASA discoveries and are able to see them for themselves when visiting a national park. 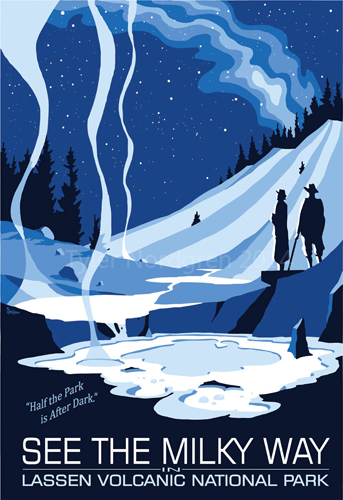 To help park rangers promote their astronomy outreach programs, Dr. Nordgren has created a series of 1930s WPA-style posters advertising a park's dark-sky programming and other astronomy related events. If you are a ranger that would like a poster created for your park, Dr. Nordgren is happy to work with you to create one tailored to your program.